One of our hamfest supporters is C-COM Satellite Systems, Inc. Our ham radio operators that support EMCOMM will find enjoy visiting with C-COM and learning more about their wide variety of communications gear. Established in 1997, C-COM Satellite Systems Inc. is a world leader in the design, development, and manufacture of commercial grade, fully motorized, auto-pointing mobile antennas (iNetVu®) for the delivery of broadband Internet to remote locations. The company has been a pioneer in the one-button, auto-deploy VSAT market – with over 7,000 units in the field, in over 100 countries. The iNetVu® brand is synonymous with reliability, affordability and superior technology. C-COM has developed Comm-on-the-Pause (COTP) antennas that operate in all major satellite bands (Ka, Ku, C, and X-band), in sizes (from 75cm to 2.4M) and in various formats (Driveaway, Flyaway, and Fixed Motorized). 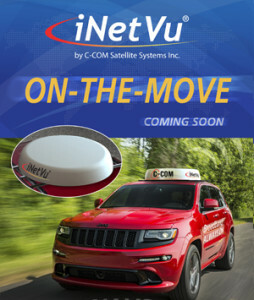 The iNetVu® 7000 Controller series allows users in any vertical market to connect to any satellite in under 2 minutes, with just the push of a button, providing voice, video, and data to users around the globe. Users of the iNetVu® product include World Governments, Militaries, Oil & Gas companies, Broadcasters, Emergency Responders, Hospitals (Telemedicine), Banks (Mobile Banking), Schools (Mobile Education), Race Teams, Mining Companies, and many other verticals. The Company is currently involved in the design of the Next-Generation ‘always on’ Comm-On-The-Move (COTM)antennas for the Ka-band market. These new antennas will address the delivery of ‘always on’ Ka-band broadband solutions into land-based, on the move vehicles like cars, trains, buses, etc. Information Courtesy of C-COM Satellite Systems.